Now that it’s officially summer and it’s been getting into the 90s here this past week, The Peck household is entering into what we deem as “the hot season”: June through Sept (sometimes into October 🙁 ) Some of you might just call this “summer”, but it’s more than just summer to us – when you don’t have central air in your house, it quite accurately becomes known as The Hot Season. Every aspect of our lives at home is impacted by the heat. We’ve lived in this small, non-air-conditioned home for 5 years now. This will be our 6th summer here. I’ve been working from home, so I’m usually here all the time during the day. C is a September baby, so I’ve also suffered being huge and pregnant though the heat. Average summer temps for my area are mid-high 90s, but we get a few days each summer in triple digits. 1) We are extremely mindful of the changing temperatures throughout the day and adjust behaviors accordingly. In the early mornings, all windows are opened. When the house starts heating up in the early afternoon, all windows are shut and the window unit in the living room is turned on. In the late evenings, window unit is turned off and windows are again opened up. 2) We choose our summer at-home clothing carefully. For months each year, I live in flip flops, sun dresses and flowy skirts, camis and flowy tank tops. Natural, breathable materials are a MUST. My kids are only fully dressed if we’re going somewhere. C will wear skirts and sundresses, S will wear either shorts or a shirt, but hardly ever both at the same time; toddlers can get away with half nakedness. 🙂 My hair gets pulled up into a bun. I only wear jeans or makeup if I’m leaving the house. 3) We eat lots of cold things in the afternoons. Popsicles are a staple. Frozen GoGurts are also popular. Now that we got a Ninja blender from a Black Friday sale last year, I’m going to try to make smoothies a regular this summer as well. 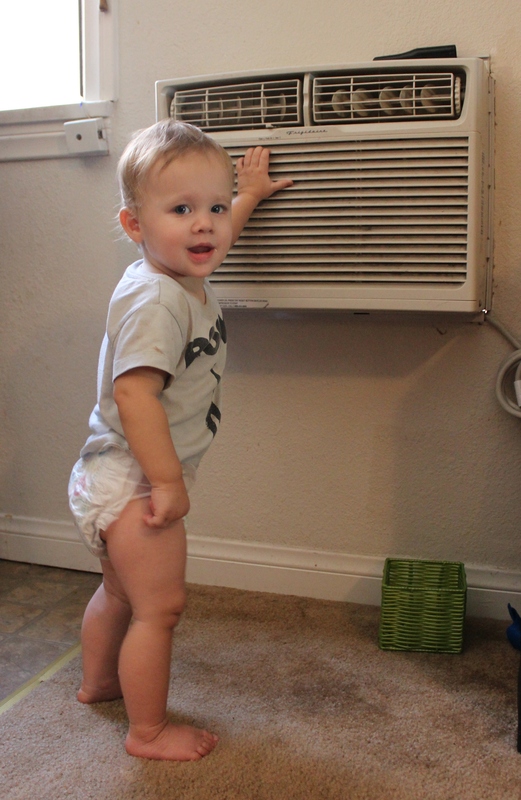 4) I am always aware of the cooling mechanisms available to me and how I can best use them. We have one window unit in the living room. This helps a lot, but unfortunately doesn’t do much to cool the bedrooms, just the dining room and a small part of the living room. But it helps. When we’re desperately hot, we play games and read books and eat lunch on the floor in front of the unit. We just this year (finally!) installed ceiling fans in the bedrooms. We also have a standing fan in each bedroom. C has a small fan just on her bed. KP got a Dyson Air Multiplier on an awesome groupon sale a few years ago that we additionally move to wherever in the house it’s most needed. We make it work. 5) Cool showers and baths in the late afternoons/evenings. Going to bed with damp hair is especially cooling. Either that, or we take a cool, damp washcloth and wipe down our arms, legs and face. we give up, get out of the house and go somewhere that has A.C. for a few hours: Starbucks, Barnes N Noble, the grocery store, McDonalds, whatever, just somewhere. Heck, even sitting in the car – which has A.C. – is considered a refreshing break. Ultimately, though the hot season of summer without central air can be unpleasant, we just push though and embrace the sweat. At least once every year during the dog days of late summer I tell KP that I can’t do this another summer and that we need to move before next summer. But we never do (because we really like our location and rent). So when it’s really, really, hot and miserable, I just have to remind myself that the hot season is just a season. And as with all seasons of weather and life, this time will pass. Things will get better. Fall will come. It will cool down. And it always has. And it always will. My question is: How do you SLEEP? I live in Ohio where our summers do get hot–we never hit the triple digits, but we get humid days in the upper 80s and low 90s. My A/C broke a few summers ago and it took a few days to get it fixed, and I absolutely could not sleep, not even with the fans. So how do you do it?! 1) shower before bed, or wipe down with a wet wash cloth, so that my skin is cool. 2) fans on and windows open. 3) wear very little clothing (my kids sleep naked most of the summer). 4) a thin, cotton sheet lightly covering one leg helps keeps my legs from sticking together while trying to sleep. 5) if it’s REALLY bad, I’ll put a cool damp wash cloth on my forehead as I fall asleep. 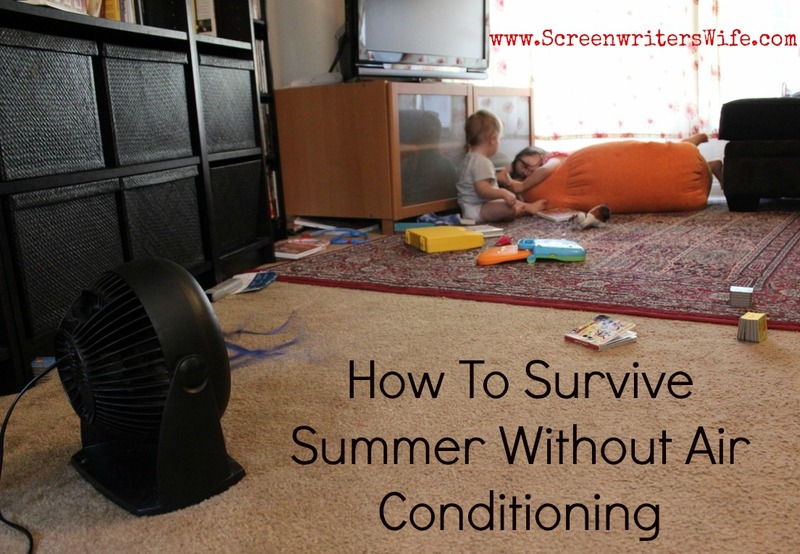 We also live without central air — or any air conditioning for that matter. Like you, we keep our windows open when it’s cool (all night and into the early morning), then shut up the house for the day. We have fans to circulate the air, and set them up to create a current of air through the house at night. Cool foods and water play and/or baths in the midst of the hot afternoons help. I think the hot weather is a helpful reminder that we reside on a living, seasonal planet, even if it’s not always the most comfortable. wow, no window unit either? And I agree that in a way, the nice thing about not having air conditioning is that I feel more in touch with the outside world. There’s no big temperature shock going from outside hot to inside cold and vice versa. My body stays at a more even temp all day. There are definitely times when a window unit or something would be nice (especially at night), but when we actually think about buying one, we all decide there are more important things or goals and decide to do without. I grew up without A/C for a large portion of my childhood until my parents were able to save-up for it. The only window-unit was in my parent’s bedroom (and turned-on only while they slept). I concur with many of the suggestions you’ve outlined. I recall going to sleep with a wet washcloth on my forehead to the point that now it’s something that brings be comfort when I’m in pain or ill. When it was extremely hot we slept on my parent’s bedroom floor for the A/C. Without A/C it encouraged us children to be out of doors for a majority of the day and to spend ample amounts of time at the city pool, running under a sprinkler, reading under trees. While I’m grateful for air conditioning and the comfort it brings, there are great things to be said for minimal use of it.